And so we come to Dixon v. Ford Motor Co., No. 14–CV–6135 (JMA) (ARL), slip op. (E.D.N.Y. Sept. 30, 2015). Obviously, Dixon isn’t a drug or medical device case. Rather, it’s a class action alleging purely economic loss from the defendant’s alleged sale of cars that let exhaust fumes into the passenger compartment. The absence of any personal injury claims meant that the “no privity” amendment to New York’s UCC didn’t apply. Thus, “Defendant is correct that the general rule in New York is that, absent privity, a plaintiff cannot recover damages for economic loss based upon breach of implied warranty.” Slip op. at 8. Plaintiff, however, dredged up the old Goldberg “thing of danger” exception to privity and claimed that even though not seeking any personal injury damages, the purported potential exposure to exhaust fumes (focusing mostly on carbon monoxide) created a “risk” of injury that implicated Goldberg. Id. at 8. In interpreting New York law, a federal court sitting in diversity must follow the substantive law set forth by the Court of Appeals. Where the substantive law of the forum state is uncertain or ambiguous, the job of the federal courts is carefully to predict how the highest court of the forum state would resolve the uncertainty or ambiguity. [S]ee also Day Zimmermann, Inc. v. Challoner, 423 U.S. 3, 4 (1975) (“A federal court in a diversity case is not free to engraft onto those state rules exceptions or modifications which may commend themselves to the federal court, but which have not commended themselves to the State in which the federal court sits.”). Dixon, slip op. at 8-9 (other citations and quotation marks omitted). Goldberg, the Dixon decision pointed out, was a personal injury case. Slip op. at 9. Probably due to the amendment to the UCC, “in the more than 50 years since Goldberg was decided, no New York state court has adopted [its] ‘thing of danger’ exception or followed a similar approach in purely economic loss cases.” Slip op. at 9. Rather, “New York state courts have stressed that Goldberg was a personal injury case.” Id. Equally important, “numerous New York state court decisions have rejected economic loss claims based on a lack of privity in situations where the product at issue was clearly dangerous.” Id. (citations omitted). The few contrary federal decisions didn’t offer any reasoning why Goldberg – after going uncited for so long – should be expanded into non-personal injury cases. Therefore, “this Court concludes that, under New York law, there is no ‘thing of danger’ exception to the privity rule for implied warranty claims that involve purely economic loss.” Dixon, slip op. at 10. Since the same purveyors of no-injury class actions also target our clients with the same sorts of baseless litigation, we thought our readers would like to know about Dixon. Privity doesn’t exist in the prescription medical product realm, so the Dixon reasoning should eliminate such actions in such cases in New York. There are other aspects of Dixon – express warranty (pp. 5-7), third-party beneficiary (pp. 10-12), Magnuson-Moss (p. 12), and consumer protection (pp. 13-17) – but they’re not very pertinent to drug/device litigation. We’d like to thank Jeff Yeatman of DLA Piper for sending Dixon to us. Postscript on things New York related. We’ve probably never linked to a plaintiff-side source before (except to criticize it), but the summary of New York product liability decisions from 2002-2015 – more than 500 cases – available on the Rheingold, Valet website is a valuable resource for anyone (plaintiff or defendant) looking to familiarize him/herself with this body of law. Too bad they don't seem to update it. [MMIT Unleash the power of your brilliance! "Let your light shine!" Have you heard that a million times and never really understood it, or does that thought create some anxiety for you? Over the years I have discovered what it means to step into my greatness and truly live in my Brilliance. And I want to share these secrets with you! I've teamed up with my colleague Lacey Sherwood and 20 other experts to share how we have all moved from a place of fear, doubt and lack to a place of empowerment, belief and abundance. Imagine what it would be like to show up in your authentic brilliance, free from the worry of other people's judgment, living the life you came here to live! Whether you are holding back in big or small ways; personally or professionally, we will share with you the small, easy steps you can take to immediately shift into YOUR Brilliance and shine in every area of your life! 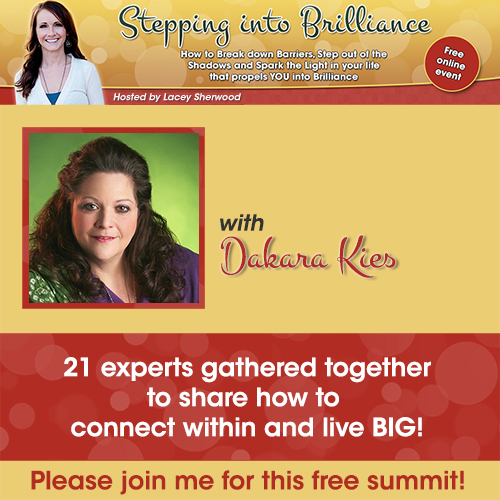 Best of all, the Stepping Into Brilliance summit is Free. Plus every speaker has a special free gift for every participant. Register now at http://steppingintobrilliance.com/DK to get all this juicy insight from 21 experts at the top of their industry. It's the first step to your Brilliance! Isn't it time you shine your light? Throughout my life, I've seen how most people hide from the spotlight, shy away from praise and deny their gifts and talents. I'm being featured as an expert in an upcoming summit called Stepping into Brilliance, and I want you to be my special guest! I know this has the power to shift your life in a huge way. Sign up at http://steppingintobrilliance.com/DK to get free access to all of the amazing materials available at the Stepping into Brilliance summit. [Drug and Device Law] What To Do About Junk Science That's Published? An ever-growing chorus of academicians report that with the expanding number of academic journals there is a concomitant increase in the number of articles based on questionable methodology. Many published studies contain improper statistical conclusions, flawed methodology, and results that cannot be replicated. The recent controversy concerning the failure of parents to vaccinate their children because of the recommendations of flawed research exemplifies this crisis. This epidemic of faulty research has been exacerbated recently by the spread of low-quality academic journals and “pay-to-publish” journals, which will publish virtually anything for a fee. This Article provides an analysis of a growing crisis of reliability in scientific research and how the so-called “researchers’ privilege” allows faulty research to go undetected. This Article delineates the reasons why it is difficult, if not impossible, to evaluate published research findings without access to the underlying information that researchers have in their possession. The Article then analyzes the state of the law regarding the ability of researchers to withhold records and data based on the so-called “researchers’ privilege.” Finally, the Article explains why courts should favor the disclosure of research data and that confidentiality concerns should be addressed by a confidentiality order. [S\ome statistical errors in research publications transcend mere misunderstanding and instead show that researchers manipulate statistical methods to obtain the desired results. Psychologist Uri Simonsohn calls this phenomena “P-hacking,” and others refer to it as “data-dredging, snooping, fishing, significance-chasing and double-dipping.” Statistics defines the P-value as “the probability that an observed positive association could result from random error even if no association were in fact present.” For example, suppose that in an epidemiology study investigating the potential association between the administration of vaccines and the development of side effects, the P-value is 0.05. This P-value indicates that even if the vaccine had no effect, a positive association could be obtained in 5% of the studies due to random-sampling error. Unfortunately, researchers can manipulate this relatively straightforward statistic. Id. at 9-10 (numerous footnotes omitted). Basically, if somebody applies enough different statistical methods to the same data (or subsets of it), that will increase the likelihood that − purely by random chance − one of those methods will generate a significant result. A proper study sets out its protocol for statistical analysis in advance, so as to preclude after-the-fact massaging of the numbers. However, lousy journals don’t pay attention to this prospective/retrospective distinction. If you’re into that kind of analysis, you’ll like this article. The article’s legal recommendation – that attorneys faced with such expert opinions in litigation be able to obtain the data that supposedly supports the conclusions – is something of a two-edged sword. If we can do it (subpoena underlying raw research data) to their experts and their experts’ sources, then the other side can do it to us. Overall, however, since plaintiffs are already seeking, and often receiving, access to our client’s internal clinical trial databases, we probably have more to gain from the demise of any “researcher’s privilege” than we would lose. While all statistical studies have their flaws, we believe that those we rely upon are far more scientifically valid than what the other side has to offer. Full access to the other side’s data (where they have any) should allow us to prove that. In any event, for defense counsel attempting to examine independently the statistical basis of the studies the plaintiff is relying on, the article is also a thorough collection of the precedent in this area. At minimum, even if the data remain confidential, we need to get our hands on, at least, the protocol and IRB (“institutional review board”) documents. Things like timing of the protocol in relation to when the research started (the p-hacking point already discussed), amendments of the protocol, the power calculations, and the prospectively identified analyses will often reveal if the study results that plaintiffs like really exist, or are the result of statistical legerdemain. This, in particular, is less of a two-edged sword, since manufacturer-funded studies can’t (for FDA reasons, if nothing else) hide this kind of information. Beyond his article, Dr. Frank just doesn’t quit. In our recent correspondence, he sent us three recent pieces (too recent for his article) that also concern academic fraud in published scientific research: (1) how false statements by research subjects seeking to participate in clinical trials can adversely affect the results, here; (2) a retraction in which the “fabricated results” are admitted, here; and (3) an article about complete fabrication of the peer review process – involving 64 articles in 10 journals – whereby authors wrote “peer reviews” of their own articles using spoofed email addresses, and false identities, here. We agree that all-too-frequent problems with scientific literature, whether intentional or otherwise justify courts in not permitting researchers to hide their data and methods from independent critique behind newly invented “privileges” of doubtful provenance. The scientific method is based on the process of constant exposure of all theories to rigorous tests of verification and falsification. Michigan’s Product Liability Act is a thing of beauty. Behold its splendor and majesty: "In a product liability action against a manufacturer or seller, a product that is a drug is not defective or unreasonably dangerous, and the manufacturer or seller is not liable, if the drug was approved for safety and efficacy by the United States food and drug administration, and the drug and its labeling were in compliance with the United States food and drug administration’s approval at the time the drug left the control of the manufacturer or seller." Mich. Comp. Laws § 600.2946(5). Like a supermodel with a mole, the Michigan law possesses an imperfection that almost enhances its beauty. The Act contains two exceptions to this blanket immunity granted to drug manufacturers. First, a drug manufacturer will not be immune if it “intentionally withholds from or misrepresents” information from the FDA, whereas the provision of such information would have either prevented FDA approval to begin with or would have prompted the FDA to withdraw approval. Second, bribery of an FDA official would call off the immunity. Pennsylvania law is not quite as good. Or let’s put that a different way. If the Michigan law is the Mona Lisa of American product liability law, Pennsylvania’s version is more like an episode of Bowling for Furniture, or a YouTube cat video. Let’s leave it at this: there is a conflict of laws. We know which law we would apply. And, happily, the Pennsylvania court agreed. Pennsylvania’s choice of law rule combines the approach of the Restatement (Second) on Conflicts of Law and the interests of the state analysis. Michigan was the place of alleged injury for each of these cases. The conduct causing the injury occurred in both Michigan, where the plaintiffs and their prescribing physicians received any misrepresentation regarding Risperdal and where the plaintiffs were prescribed, purchased, ingested and allegedly injured by the drug, and Pennsylvania, where one of the defendants was alleged to have concealed material information regarding the safety of Risperdal. A review of the legislative history of Michigan Products Liability Act shows that it was passed for the express purpose of limiting the liability of drug manufacturers. By contrast – and here we confess to being almost amazed that our local court had such a moment of enlightenment, Pennsylvania has no interest in becoming “a repository for cases filed by Michigan residents seeking to avoid application of the Michigan Products Liability Act.” Even if the Michigan Product Liability Act seems “harsh” (that was the word the Philly court used; we prefer “sound,” “logical,” “lovely,” or “calipygian”) it governs the case of these Michigan plaintiffs. So, saddled with the law of the jurisdiction where they live, vote, and root for the hapless Lions, the plaintiffs presented three arguments why the Products Liability Act does not apply. First, they argued that Risperdal was not, in fact, approved for safety and efficacy by the FDA because its label did not contain an indication for adolescent use. Second, the plaintiffs argued that they met the first exception to the Products Liability Act because the defendants withheld information from the FDA and a question of fact existed as to whether Risperdal would have been approved, or maintained its approval, if the withheld information had been supplied to the FDA. Finally, the plaintiffs argued that a prior guilty plea by one of the defendants was tantamount to a federal finding of fraud on the FDA. Each one of those arguments was a swing and a miss – something seen often this season with the surprisingly crummy American League Detroit baseball franchise. First, a physician’s decision to use a pharmaceutical for an “off-label” purpose is not only an acceptable practice, but also “an accepted and necessary corollary of the FDA’s mission to regulate in this area without directly interfering with the practice of medicine.” The “off-label” use did not somehow render the label unapproved. Second, the issue of whether the defendant lied to the FDA in getting its label opens up once more the issue of whether such an exception is preempted by Buckman. The Michigan state courts have not yet addressed the issue of whether § 600.29(5)(a) is preempted by the FDCA. As we have mentioned many times before, the federal courts are split on the preemption issue. The Sixth Circuit, which includes the federal courts in Michigan, decided that § 600.29(5)(a) is implicitly preempted. Garcia v. Wyeth-Ayerst Labs., 385 F.3d 961, 966 (6th Cir., 2004). Conversely, the Second Circuit went the other -- that is, wrong – way. Desiano v. Warner-Lambert & Co., 467 F.3d 85 (2nd Cir., 2007), aff’d by an equally divided court sub nom, Warner-Lambert Co., LLC v. Kent, 552 U.S. 440, 128 S.Ct. 1168 (2008) (per curiam)(4-4 decision). We wish the Philly court would have come down on the side of Garcia, but it concluded that it did not need to, because (1) there had been no federal finding of fraud, and (2) even if there was a federal finding of fraud, the plaintiffs produced no facts showing that “the drug would not have been approved, or the [FDA] would have withdrawn approval for the drug if the information were accurately submitted.” Indeed, in response to a citizen’s petition, the FDA recently declined to withdraw Risperdal from the market, stating “based on review of clinical data submitted by the sponsor, published literature, and postmarketing surveillance, there is no evidence … that would warrant revocation of the pediatric indication of [Risperdal]." That leaves the plaintiffs' argument that a November 2013 guilty plea showed fraud. And here we must confess, ala a classic Elmore Leonard story, to withholding a fact that registered a bigger impact upon delayed disclosure. That guilty plea related to promotion of the drug for the treatment of dementia in the elderly. That guilty plea was, in other words, “wholly irrelevant” to the question of whether the defendants submitted accurate information to the FDA concerning the frequency of developing gynecomastia after taking Risperdal during adolescence. There are one or two other rulings in the case. They are minor characters. Leonard famously issued his Ten Rules for Writing. One of them was “Try to leave out the part that readers skip.” Perhaps we have already violated that rule. This is the punchline: the Philly court did a fine job, it chose the right law, any merit to the plaintiffs’ arguments was out of sight, and the summary judgment in favor of the defendants was entirely justified. Twice this month we’ve reported on “the saga of Cymbalta plaintiff lawyers who keep pushing the litigation up a hill in an effort to create a class action, mass action, MDL, or whatever will allow them to park as many meritless cases in one place, only to have that litigation roll back down the hill, resulting in crushed toes, directed verdicts, and jury findings of no liability.” Let’s make it a trifecta. Both with our third post and with three more decisions severing the claims of misjoined plaintiffs who have nothing in common except that they each used Cymbalta and they each allege injury. The cases are Jones v. Eli Lilly, 2015 U.S. Dist. LEXIS 141925 (S.D. Ind. Oct. 19, 2015) (15 plaintiffs from 11 states); DeCrane v. Eli Lilly, 2015 U.S. Dist. LEXIS 141924 (S.D. Ind. Oct. 19, 2015) (2 plaintiffs); Boles v. Eli Lilly, 2015 U.S. Dist. LEXIS 141922 (S.D. Ind. Oct. 19, 2015) (19 plaintiffs from 11 states). the claims of fifteen Plaintiffs from eleven different states whose allegations rest on distinct, unrelated factual scenarios: Cymbalta treatment over fifteen different time periods, presumably in eleven different states, for several different conditions....; use of the medicine under the care of multiple healthcare professionals from a range of medical subspecialties, affiliated with different practices and, potentially, varying degrees of exposure to the relevant product labeling; a host of potential co-medications and comorbidities; and, finally, Plaintiffs' particular discontinuation methods (whether abrupt or tapered over varying lengths of time) which allegedly resulted in a range of symptoms of varying type, severity, and duration. Jones, 2015 U.S. Dist. LEXIS 141925 at *16-17 (all three decisions are virtually identical, so we cite to Jones throughout). In response to plaintiffs’ arguments that Lilly’s conduct was the “common issue” permitting joinder of these diverse claims, the court noted that what plaintiffs never said was why these particular plaintiffs were joined together. It appears “claims by people from different states were batched together in haphazard fashion.” Id. at *18 (emphasis added). Plaintiffs had no reason why any particular group of plaintiffs was joined together in a single complaint because there is no reason. See above case description. The court was never persuaded by any of plaintiffs’ arguments that tried to make Lilly’s conduct “the sun, the moon, and the stars” of the litigation. While some claims may turn on how the product was marketed and sold generally, “the crux of Plaintiffs’ claim – that Lilly’s actions caused injury to them – do not.” Id. at *21. As an example, the court uses allegations of fraud which “likely will not turn on the wording of Lilly’s warning, but rather on whether each Plaintiff’s medical provider – or “learned intermediary” – conveyed that warning to their patient.” Id. Quite right. And because the learned intermediary doctrine comes into play in both fraud and failure to warn claims, the plaintiffs’ individual doctors are the stars of the show. “So, while there may be some occurrences that are common to Plaintiffs’ claims, the key occurrences (here, Plaintiffs’ interactions with their medical providers) will not be common.” Id. Each Plaintiff will need to show that Lilly's conduct caused his/her injuries, which will require evidence relating to why his/her health care provider prescribed Cymbalta, the nature of his/her health care provider's knowledge regarding withdrawal from Cymbalta, for what medical condition he/she was taking Cymbalta, how much Cymbalta he/she was taking, how long he/she took Cymbalta, and how he/she attempted to discontinue using Cymbalta. These issues are at the very core of those Plaintiffs' claims, require highly individualized inquiries, and are apparent from Plaintiffs' allegations in the Complaint, which include plaintiffs who took Cymbalta for different amounts of time, for different reasons, likely discontinued Cymbalta using different methods and strategies, and suffered different symptoms. These differences make Plaintiffs' claims improper for joinder. The Court also recognizes that keeping Plaintiffs' claims joined will have little to no positive impact on each Plaintiff, but will be much more convenient for Plaintiffs' counsel. … Plaintiffs' counsel chose to file numerous lawsuits, most with numerous plaintiffs from numerous states, all over the country. The joinder rule does not include convenience to counsel as a consideration. Instead, Plaintiffs' counsel must be prepared to devote the resources needed to effectively litigate each client's claim, and should not file numerous lawsuits on behalf of dozens of clients if unable to do so. Rather than convenience to counsel, the Court is concerned with effectively and efficiently resolving each litigant's controversy. Id. at *28-29 (emphasis added). Even plaintiffs’ counsel’s arguments that savings to them would be savings that they could pass on to their clients weren’t enough to get the court to overlook the glaring misjoinder problems with these cases. The reality is these cases were brought by a handful of plaintiffs’ lawyers who assumed there would be consolidation of some sort and they don’t have the means (financial or otherwise) to litigate them individually and spread out throughout the country. To this the court said, don’t file what you can’t handle. whether defendant is willing to bring its witnesses for live testimony at trial. Id. at *36-37. With only the last factor potentially weighing against transfer, this list looks pretty good. We don’t know where all of the defendant’s witnesses are or what kind of burden that last factor might be, but given the likely benefits of transferring these cases around the country, we sure think it’s worth considering. We’ll be on the lookout for the transfer decisions to see if this turns out to be the complete trouncing of plaintiffs’ counsel that it should. Who knows, there may be a Cymbalta case headed to your home jurisdiction in the near future. [Drug and Device Law] Should We Expand the Collateral Source Rule? No Thanks. But, when plaintiffs try to expand the rule to allow recovery of medical costs that were never actually billed, it’s time to hold the line. That’s exactly what the plaintiff in Hoffman tried to do, seeking to hold the defendant liable for the $1,500 sticker price for an MRI at a hospital and not the $475 discounted price that plaintiff was actually billed. In other words, plaintiff wanted payment for a theoretical bill, not the real one. It wasn’t enough that the defendant pay medical bills that had already been paid once before by plaintiff’s insurer. Plaintiff also wanted the defendant to be liable for an amount higher than the bill. That’s not the purpose of the collateral source rule. [A]llowing the plaintiff to recover an amount for which he has not paid, and for which he has no obligation to pay, is at cross purposes with the basic principles of tort recovery in our Civil Code. The wrongdoer is responsible only for the damages he or she has caused. Id. at *4. Nor did it matter to the court that the plaintiff got the MRI price discount through negotiations by his lawyer. Granting an exception for attorney-negotiated discounts would verge on subverting the American Rule that litigants bear their own legal fees and create a quagmire of ethical questions surrounding the arrangements between plaintiff’s lawyers, their clients and medical providers. Id. at *5. There could be too much, how should we say it, collateral damage. Better to simply stop expansion of the rule.